As I type this the kids are hurrying around the house getting ready for the Saturday morning sessions of the Family Driven Faith Conference. This is such a treat! A few weeks ago my wife and I were able to attend the Alliance Defense Fund Academy in California and spend the entire week with Voddie and precious wife Bridget. Last night Voddie shared two lectures – The Culture War and A Multigenerational Vision – both excellent! My prayer today? Give me grace to be more disciplined in my home and faithful in the things we hear. 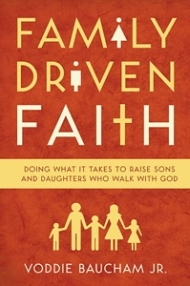 Family Driven Faith equips Christian parents with the tools they need to raise children biblically in a post-Christian, anti-family society. Voddie Baucham, who with his wife has overcome a multi-generational legacy of broken and dysfunctional homes, shows that God has not left us alone in raising godly children. He has given us timeless precepts and principles for multi-generational faithfulness, especially in Deuteronomy 6. God’s simple command to Moses to teach the Word diligently to the children of Israel serves as the foundation of Family Driven Faith. About the Author: Voddie T. Baucham Jr. is a pastor, professor, conference speaker, and Bible teacher. He is a graduate of Southwestern and Southeastern Baptist Theological Seminaries and has also studied at the University of Oxford. Baucham is the author of The Ever Loving Truth and the Telly Award-winning Ever Loving Truth Bible study curriculum. He and his wife, Bridget, have three children.